Today is not a travel day. We knew we’d need a few hours to buy a cooler and some picnic things, so we scheduled two nights in South Burlington to give us an errand day. Since the weather was rainy and windy this morning, we did those first. By mid-day, the sun was peeking through, so we walked part of the Burlington Bikeway, and that led us to having our picnic lunch at the Burlington Beach campground. Not sure that’s the proper name, but it’s on Institution Road. This is the off season, so no admittance fee. 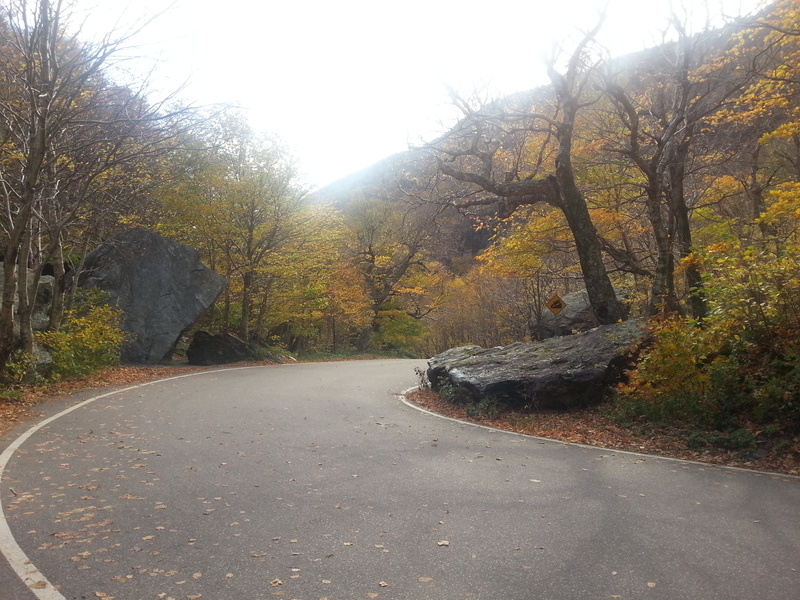 In the afternoon, we took a forty-five minute drive out to Smuggler’s Notch, which takes its name from the Prohibition era, and is where Highway 108 narrows to a single lane to wind through blocks of rock at the highest point of the pass. Smuggler’s Notch. Saw the Least Likely Licence Plate of the Day there: Tennessee. The driver was getting out for a look around so I tried to speak to him but I had trouble with his accent. He was from Denmark. This morning’s windy weather may have taken a toll on the foliage, the trees were a little bare at the higher elevations. We did see the covered bridge at Stowe, but we didn’t photograph it. Sorry, Dwayne, but the original bridge is now the pedestrian walkway attached to the more modern road bridge, so it looks more like a covered sidewalk, and it would be tricky to get a picture that brought out its historical best. Maybe we’ll find another. Back to Burlington to try and figure out where the filler cap is and how to open it so we could buy fuel. I had actually given Caroline permission to open the forbidden manual of arcane knowledge by the time I found the release. It’s okay, this wasn’t witnessed by any men. We hear good things about the restaurant at our Best Western, but it’s a steakhouse, and neither of us is really into red meat by the pound. We’ll figure something out, maybe pizza.